“The Big One” is gonna be BIGGER than originally thought. A huge fault in the Earth’s crust near Los Angeles is leaking helium, researchers have found. They say the unexpected find sheds new light on the Newport-Inglewood Fault Zone in the Los Angeles Basin. It reveals the fault is far deeper than previously thought, and a quake would be far more devastating. It follows a report from the U.S. Geological Survey has warned the risk of ‘the big one’ hitting California has increased dramatically. The M 7.8 San Francisco earthquake of 19O6 struck the coast at 5.12 am on 18 April 18. Devastating fires lasting several days broke out in the city. As a result about 3,OOO people died and over 😯 percent of San Francisco was destroyed. The earthquake and resulting fire are remembered as one of the worst natural disasters in the history of the US alongside the Galveston Hurricane of 19OO and Hurricane Katrina in 2OO5. 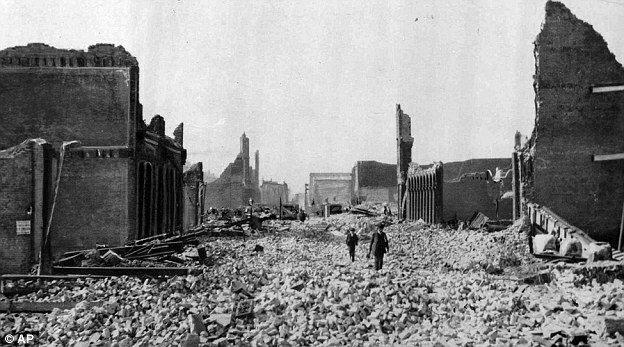 People walk through the rubble following an earthquake in San Francisco on April 18, 1906. On April 17, 1906, San Francisco was cosmopolitan enough to host Enrico Caruso in ‘Carmen’ and so financially flushed it ranked fourth among American cities in raising money to help victims of a volcano in Italy. A day later, San Francisco was pleading for help itself after a giant earthquake struck along the San Andreas fault.